In what cryptocurrency NEM’s CEO Lon Wong is calling “The biggest theft in the history of the world,” $400M in NEM was stolen from an unlicensed Japanese exchange. 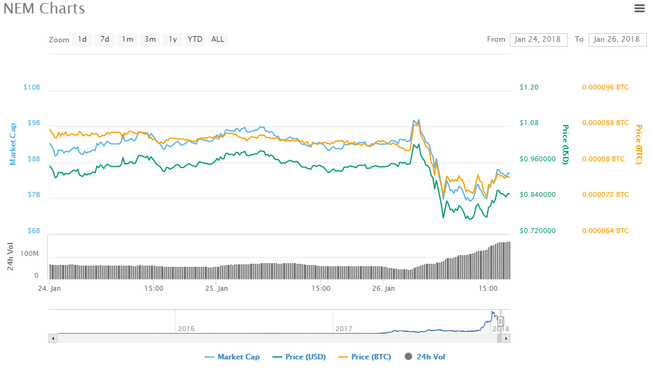 The news sent NEM’s price tumbling, as Wong insisted it was solely an issue with the exchange itself, and that NEM’s underlying integrity remained rock-solid. “As far as NEM is concerned, tech is intact. We are not forking. Also, we would advise all exchanges to make use of our multi-signature smart contract which is among the best in the landscape. Coincheck didn't use them and that's why they could have been hacked. They were very relaxed with their security measures," Wong said.